A sponsor of Alabama's immigration bill wrote an opinion piece in USA Today that emphasizes something I've repeated ad nauseam, namely that no such thing as sufficient enforcement exists. Most people, including myself, wish the federal government would enforce its laws, but that is not going to happen any time soon. The people who oppose state initiatives are simply against any enforcement. They have little regard for the negative impact that illegal immigration has on the legal residents of the states or the rule of law. Now, the numbers. From the Department of Homeland Security, here are the number of deportations for the past ten years. Quite clearly, the Obama administration has deported far more people than any previous administration. Now, let's move on to getting rid of criminals. According to DHS, the U.S. deported 92,221 criminals in 2005 and 168,532 in 2010. And employers? In 2010 the administration started 2,746 formal workplace investigations in addition to audits, which was double that of 2008. The Obama administration has enforced immigration laws more than any past administration, Republican or Democratic. You may think that to be positive or negative, but it is empirically true. It is therefore unfortunate that the myth of non-enforcement persists, and that this myth becomes an unsubstantiated rationale for congressional refusal to pursue anything beyond enforcement or for states to pursue harsh laws of questionable constitutionality. The image of Chile in the U.S.
Judging from the polls, and from what I heard here, they want the Chilean model to make a much-needed correction and transfer more of the country’s recent prosperity to the needy, but they won’t support destroying a vibrant democracy that produced sustained growth for the past two decades. Say what? Nobody is calling for or expecting the destruction of anything, most certainly not democracy. Inserting that suggests that Chilean students are somehow intent on overthrowing the system. So many of these commentaries have an anachronistic flavor, perhaps because a key student leader is a member of the Communist Party. But Chilean politics in 2011 are not anything like 40 years ago. The Socialist Party has long been committed to free market capitalism, and the Communist Party long ago rejected armed struggle or anything approximating it. It is not terribly radical to argue that students are saddled with too much debt to get a university education. You can either agree or disagree with the students' arguments, but it is ridiculous to suggest that it equates to an attempt to destroy democracy. If you want to understand the conservative response to the protests and strikes in Chile, then check out this editorial at Investor's Business Daily. It is a U.S. publication, but I think can usefully serve as a proxy for the Chilean right as well. It is written by someone who seemed to have gone to sleep around 1982, then suddenly woke up in 2011 and thought Ronald Reagan was alive and the Cold War was still going on. The bottom line is that Santiago is Berkeley, and the Chilean protests are led by Communists who want to destroy everything that is good. Absurd, yes. But believed by many. The editorial's lesson: never have dialogue with anyone. (I am not making that up.) If the Chilean right believes this sufficiently, then it may well erode the right's already shaky confidence in Sebastián Piñera thought perhaps he could pick up support from the center. Clearly, Hugo Chávez has decided to double down on Libya, which puts him in a small select group, namely joined only by Daniel Ortega. Poor Gaddafi, who was just a nice anti-imperialist guy, suddenly attacked by violent hordes for no valid reason. I am of two minds about Felipe Calderón blaming the United States for the vicious attack in Monterrey because of drug demand. The first is to agree to a considerable extent. There is a very basic supply and demand dynamic at work, while the balloon effect has pushed some of the most pernicious effects of the drug trade into Central America and Mexico. Without a wealthy population in the United States with a seemingly bottomless appetite for drugs, there would be less violence. To its credit, the Obama administration has publicly acknowledged the demand side, but this needs to sink deeper into the U.S. consciousness. Instead, we see loads of headlines about "Mexico's drug war," which gives us a smug sense of satisfaction that those Mexicans are causing all our problems. The second is to be skeptical, especially about this particular case. The United States did not create the organized crime that hovers around Mexican gambling and has for decades. There is a real danger that, as happened for years with immigration, the Mexican government uses the U.S. as a convenient scapegoat and thereby feels less pressure to address serious structural reforms that Mexico needs. Calderón is right to point the finger at the United States, but not at this particular moment in time. Drug consumption in the United States was not what allowed the attack in Monterrey to occur. The total impunity that reigns in Mexico -- due to the failure of police and security forces to maintain any semblance of trustworthy authority, the dragging speed of reform in the police forces, and the absence of any investigative capacity or will whatsoever -- is responsible for this atrocity. And Calderón's inability to admit fault or honestly describe the sorry state of his signature initiative is exactly what is making it so difficult for him to convince Mexicans of anything, including the notion that his party should remain in office next year. Imre Kertész is a Hungarian novelist who won the Nobel Prize for Literature in 2002, for his fiction on the Holocaust. However, he also wrote a book about Latin America, Detective Story, that was originally published in 1977 but translated into English in 2008. It is narrated by Antonio Martens, a police detective who became involved in torture in an unnamed Latin American dictatorship and now in the postauthoritarian period is on trial for murder. He was on the trail of Enrique Salinas, the son of a department store magnate, who the police believe has joined the opposition. The essence of the novel is Martens' totally clinical and hard boiled tone. He narrates like a Raymond Chandler character, uninterested in others' pain (while complaining about his own headaches). It's nasty work, I can tell you, but it's part of the job. We take away the offender's mind, shred his nerves, paralyze his brain, rifle through pocket and even his innards. We slam him into a chair, draw the curtains, light a lamp--in short, we go by the book. We didn't make any effort to surprise the offender with some original twist. Everything happened the way those ham-handed films would have prepared him for; everything happened the way he would expect (p. 83). Martens never wants to mention the violence itself. Torture simply occurs, because that's the way it is, but he doesn't want to talk about blood or pain very much. I won't spoil the ending, which has a twist, but suffice it to say the novel also examines what makes people seem guilty to paranoid and dictatorial authorities even when they have done nothing. The police start going after people, while torture and death pile up almost of their own accord. I grasped that we had now cast away everything that bound us to the laws of man; I grasped that we could no longer place our trust in anyone except ourselves. Oh, and in destiny, in that insatiable, greedy, and eternally hungry mechanism (p. 103). As we noted in the book, this had been bubbling up for quite some time and had a considerable and negative impact politically on the Concertación. It seems the change to a center-right government was the proverbial straw to break the camel's back. The Financial Times has a long and thoughtful look at fighting the flow of drugs in Latin America. What I find striking is that the mainstream media is increasingly echoing what many academics started saying a decade or more ago, namely that the drug war has failed on virtually every front and needs to be rethought. Not surprisingly, this idea is slowest to take hold in the United States, but still the facts are overwhelming and it is only a matter of time. Some in the region believe that, while they take steps to deal with the problem, the west appears less willing to make sacrifices. Mexico, for example, has embarked on police reforms that will require constitutional change to come into effect, while a US ban on domestic sales of semi-automatic rifles that expired in 2004 is yet to be reinstated. Many believe the west has also failed to tackle money laundering. As Carlos Slim, the Mexican telecoms magnate who is the world’s richest man, has observed: “It is unfair that the drug-producing countries get to keep all the problems, and the consumer nations all of the profits”. As should be clear, points one and two are evidence of opposing terrorism. Point three is a rumor, and point four is something shared by the majority of countries in the world. So the farce will continue for another year.. The liberalization of Libyan politics is going to be a messy and difficult affair (see Blake Hounshell for a good discussion) but there is no doubt that the end of Gaddafi's regime is a good thing. Arguing that the rebels are terrorists and that his overthrow represents imperialism is an odd mirror image of U.S. rhetoric particularly during the Bush administration, both of them simplistic. Meanwhile, both the U.S. and Venezuela continue to support their respective Middle Eastern dictatorships, while each criticizes the other for the nature of the particular dictatorships they support. via Sylvia Longmire, a very creepy story about Iraqis and the Sinaloa Cartel in El Cajon, California, which is extremely close to where I grew up, in the East County of San Diego. Our officers had noticed increased narcotics trafficking and violent crime in certain neighborhoods of El Cajon. These crimes have been attributed primarily to Iraqi organized crime elements, and as this investigation has discovered, the Sinaloa Cartel, a Mexico-based drug trafficking organization (DTO) which supplies them. Her immediate response was the same as mine, namely that it will not take long for people to jump on this as a sign that Middle Eastern terrorists are infiltrating the country. As long as demand remains high, then supply will move to fill it. The lessons here is that we need to maintain effective criminal law enforcement but also to reduce demand. Alarmism, however, is often more politically appealing. Tillis said he understood the motives of many people who come to the United States illegally, especially people who are fleeing drug gang violence in Mexico, but supported immediate deportation of any immigrant convicted of breaking the law. He also understood the need to control immigration, and said that ultimately it is the responsibility of the federal government. At the same time, he said farmers depend on the immigrant labor, and Tillis noted Georgia passed such restrictive laws that many produce farmers couldn’t get any workers into the fields in time and their harvests rotted. This should also be taken in the context of the Obama administration's decision to focus on criminals and to review 300,000 cases and possibly even give work permits to those without criminal records. A focus on criminals is a welcome step. From a more local perspective, I am also glad to see that the Republican leadership in North Carolina is taking a realistic approach to the issue. Poorly thought out legislation leaves you in the position of Georgia, where the legislature did not even bother doing a study about the consequences, and so scrambled to do so after the fact when those consequences became more obvious. Great editorial in the Washington Post about the myth perpetrated prominently by Republican presidential candidates (though by many others as well) that the border is dangerous and is seeing escalating violence. I've written about this over and over, but it bears repeating and repeating. The editorial gets it absolutely right that claiming the border needs to be "secured" first and then never admitting it is becoming more secure means you never have to tackle the more difficult issue of immigration reform. Horror stories about an out-of-control border are untethered from the facts. They’re also irresponsible. By using the myth of escalating border insecurity as an excuse for inaction on the pressing reality of a broken immigration system, politicians perpetuate both a lie and the national disgrace of a dysfunctional policy. Anya Landau French at The Havana Note analyzes the current push by hardline anti-Castro Congressman David Rivera to reform the Cuban Adjustment Act. Currently, Cubans who reach the United States can become permanent residents after staying here for a year. He wants that to be five years, and prohibit them from returning to Cuba in the meantime. His rationale is that the law was intended to help political refugees, and if you are returning to Cuba quickly, clearly you are not facing persecution. So far, not even Rivera yet dares threaten the Cuban Adjustment Act and the benefits (which come with taxpayer-funded U.S. government benefits, by the way) afforded to Cuban Americans under it. Ask Rivera and he'll say it should stay in place because the "political situation [in Cuba] remains the same today," as it did when the Act was passed. But of course it hasn't remained the same; Cuban Americans aren't exiles the way they used to be. And it is precisely those changed political circumstances that led Rivera to introduce his bill. Here's a question someone should and surely will put to the Congressman and his supporters of this ridiculous idea: if you're so worried about Cubans who emigrate from Cuba to the U.S. under the Cuban Adjustment Act returning 366 days later, "abusing" a law intended for refugees who couldn't return home, and these emigrants clearly don't fit the bill because they go home all the time (Thanks a lot, Obama! ), why don't you simply propose repeal of the Cuban Adjustment Act? Why not? Because that would mean admitting that Cubans are no longer FLEEING Cuba. And if America admits that the Cuban people are no longer fleeing the island as political refugees but are now mainly economic migrants - like, I don't know, Mexican migrants - then the foundation for this anachronistic and wasteful policy would surely crumble. Even our immigration policy is rooted in an anachronistic view of Cuba. The vast majority of Cubans are coming for economic reasons, not political, and therefore we should treat them in the same manner as we do all other migrants (I think we should do so more rationally and humanely for all, but that is another story). The Cold War is over. Way, way over. Regardless, Rivera is facing serious ethics investigations so may not be around for too long anyway. The National Security Archive obtained more declassified documents about the Bay of Pigs invasion, namely the CIA's own official history and some cables. The writing of the history is actually pretty lively. What we find is a mission that was in fact even more ill conceived and mismanaged than we already knew. --the CIA knew it would fail without airstrikes, and officials talked about that fact. --the U.S. approved the use of napalm for the invasion. Further, Cubans training in Guatemala were disrupted by Guatemalan rebels, and so the Guatemalan government also requested napalm to use in its own country. That seems to have been turned down--cables noted that no one in Guatemala had experience with how to deal with napalm anyway. --for "plausible deniability" the U.S. planes that were used had Cuban markings, which then drew friendly fire. --Rafael Trujillo wanted to help in exchange for giving him a place to retire, but the U.S. said no and then of course helped assassinate him. There is still more that remains classified, and I cannot imagine why (see Peter Kornbluh's discussion in the Daily Beast here). They Bay of Pigs can hardly become more embarrassing for the United States, and the relevant policy makers are dead. Maybe the CIA feels that bringing up its incompetence of the past will bring new efforts to de-fund it in the present. Fascinating discussion at Infolatam about the possible end of the binomial electoral system in Chile. People have been talking about Chilean electoral reform for years (and I've written a number of posts on it, the last one here) but it does seem to be inching closer and closer, in large part because now it is being pushed by a president of the right. Both the left and right are increasingly seeing it as a way to bring back popular confidence, which is now very low. This is a new wrinkle, as reform has not previously been viewed as something that would satisfy a constituency. Notably, no one has agreed on what would replace it, and of course that is where the real dispute will come, as both the left and right jockey to create a new system that will benefit them the most. On a cynical aside, Sebastián Piñera may also see it as a way to halt the momentum and of and the steal the press from the student protests. Electoral reform would be a very big deal. Although the election is not for more than a year, as a political scientist I can't help but get into the horse races at times. One topic du jour is Rick Perry's stance on immigration. In short, he is pretty rational--here is a good take by the Washington Post. I understand this is seen as a liability for Perry by a segment of the base. But we’ll have to see if it really is, or whether it is an argument for his electability. Perhaps this approach is too “soft” for conservatives. Maybe the RedState bloggers who helped kick off his campaign (and who are staunchly opposed to immigration reform) will recoil in horror and drop him like a hot potato. But I sort of doubt it. Yes, yes, it's early and I am not making predictions, but in the last three elections even the Republican base overlooked the relatively liberal views of the candidates (though John McCain tried to tack right at the last minute) on immigration. Immigration is an important issue, but fairly low down on the list of voter priorities, and Perry is very conservative on the issues of higher salience. He has done well with the Latino vote in Texas, and could potentially benefit from voters unhappy with Obama's enforcement-only policies. Mike Munger links to a New York Times article on the Dutch response to Muslim immigrants and rightly calls it interesting but grim reading. Read that article first. There are two parallel points I would make to responses in the United States to immigrants from Latin America. First, crime is very low among first generation Latino immigrants (even undocumented) but it can grow with subsequent generations, particularly if people feel marginalized. There is no easy answer to this, but current state laws that essentially transform Latinos into targets for police will backfire. East of Amsterdam, in Almere, the youngest city in the Netherlands, 30 percent voted for Mr. Wilders. Denying citizenship (or looking at Latino citizens warily simply because of how they look or talk) will certainly make things worse. The more you pass laws to marginalize people, the more resentful they will become. And as more marginalized people become resentful, there is greater opening for neo-fascist ideas to popularize (and perhaps take violent form). A core immigration restrictionist argument, made by both academics (George Borjas being a major example) and politicians alike, is that undocumented immigrants drive down the wages of low wage legal workers in the United States. By extension, then, policies like auditing companies should have the effect of driving out illegal workers and thereby increasing wages. As this Wall Street Journal story notes, such policies are having the exact opposite effect. The Obama administration has been raiding companies like crazy (2,393 companies in the past fiscal year, the highest ever) and this is depressing wages further. Shortly after, Alba and Eugenio, who declined to have their surname published, landed at a small janitorial concern, scrubbing car dealerships for about half the pay, without benefits. Earlier this year that employer, too, was hit by an immigration audit. In late February, Alba and Eugenio were let go. Many employers say the administration is depriving them of foreign workers who do jobs Americans refuse, even during an economic downturn, without proposing immigration reform that would supply a stable, legal labor force. "All the audits do is keep employers in certain industries awake at night, while driving immigrants into work environments and arrangements that are indefensible," said Bill Blazar, a senior vice president of the Minnesota Chamber of Commerce. Instead, everyone at the low wage level is getting less. Picture this: members of a Latin American government trample on the constitution and conduct ongoing attacks on fellow citizens who disagree with them politically. Hoping to gloss over these abuses, these same government officials create a truth commission, which concludes that the abuses aren't really so bad. Then the people who continue to suffer abuse are mocked because the report claims they are not suffering anything. That is the mind of Mary Anastasia O'Grady, who never lets facts get in the way of a story. RAJ has it here. Mike Allison notes that Rigoberta Menchú was interviewed on CNN. That got me wondering whether there was ever any other presidential candidate who generated so much international attention while receiving nothing but indifference at home (in the 2007 presidential election she received 3% of the vote, which was good for 7th place). I couldn't think of any. I see a certain parallel to post-Soviet Union Mikhail Gorbachev, a fellow Nobel Prize winner, who has consistently failed to generate interest in his new political party ideas and instead has made Pizza Hut commercials. He's hailed here and largely ignored there. Each had an important Cold War part to play, but that did not translate into long-term domestic political influence. Eduardo Dargent and Paul Muñoz, "Democracy Against Parties? Party System Deinstitutionalization in Colombia." Journal of Politics in Latin America 3, 2 (2011): 43-71. Click here for ungated PDF. This article argues that in Colombia, decentralization and electoral reforms adopted in the late 1980s and in the 1991 Constitution – designed to improve democratic quality – brought about a gradual deinstitutionalization of this country’s traditional party system as an unintended consequence. Building upon resource-based theories of party configuration, we contend that in developing countries, where resources are usually crucial for party aggregation, “democratizing” reforms designed to distribute power and resources in the political system can reduce local candidates’ incentives to join and remain loyal to political parties, particularly when those parties’ reputations are weak. In Colombia, these reforms (i) reduced the power of intermediate-level party leaders over the distribution of selective incentives, making these leaders less important for local politicians, and (ii) gave more political and financial autonomy to local candidates, reducing their need to join parties in order to advance their electoral goals. As a result, party cohesion and discipline become difficult to maintain, and the party system gradually deinstitutionalizes. Decentralization is often portrayed as a positive force, since its goal is to weaken clientelist ties and increase accountability at the local level. The argument here, though, is that local leaders don't need national parties anymore to achieve their programmatic goals, which makes individual politicians more important than the party they belong to. As a result, Alvaro Uribe came very close to amending the constitution again to run for a third term. Fortunately he backed off, but it was a warning sign for Colombian democracy. Interesting article in Political Science Quarterly, and currently ungated as well. Juan D. Lindau, "The Drug War's Impact on Executive Power, Judicial Reform, and Federalism in Mexico." Political Science Quarterly 126, 2 (Summer 2011): 177-200. The drug war, and the Mexican governmentʼs increasingly assiduous pursuit of drug-trafficking organizations, complicates the countryʼs institutionalization of democracy in a number of ways. The intensification of the drug war in Mexico has come during the waning decades of an authoritarian regime and the first years of a nascent democracy. The drug war hinders fundamental democratic institutional development, or more accurately, fosters the expansion of non-democratic institutions and practices. These effects come against the backdrop of genuine democratic gains during the last two decades, including the development of transparent and credible electoral procedures, the emergence of an assertive, divided legislature, judicial reforms, and increases in substantive federalism. Juxtaposed against this real democratization, the drug war preserves certain authoritarian proclivities of the Mexican state and fosters corruption and impunity, reducing the efficacy of judicial reforms and complicating the professionalization of the judicial branch. The security crisis engendered by the drug war fosters expanded executive power. At the same time, the drug war undermines federalism, increasing the power of the central government vis-à-vis states and municipalities. The argument is ironic. Democratization left a power vacuum that drug trafficking organizations moved into fill. Subsequently, the state's efforts to combat those organizations stalled or reversed a number of gains in democratization as re-centralization took place. El Tiempo: ¿Por qué Uribe tiene la idea, y lo ha dicho, de que esta acción contra la corrupción es una acción contra su gobierno? El Tiempo: ¿Qué significa "nopecu"? Santos has been dealing with this since before he even took office, most notably with his asserton that he would smooth relations with Venezuela, whereas Uribe hates Hugo Chávez and let the world know he hated him, and hated that the fact that Santos didn't sufficiently hate Chávez. The fact that Santos has actually made it into a joke reflects well on him, and could even make Uribe's pronouncements into a caricature of himself. It could make a good SNL skit. The OAS, along with OECD and ECLAC, has published a length document, International Migration in the Americas. Particularly noteworthy is the fact that it does not simply center on migration to the United States. 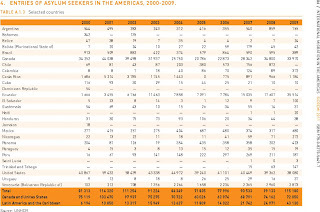 Although Latin America and the Caribbean are not considered as important destination regions for persons seeking asylum from persecution, requests for asylum have increased to approximately 49 000 in 2009, an increase of 73% when compared to figures from 2008, and quadruple the total recorded in 2000. By contrast, Canada alone received about 34 000 claims in 2009 and the United States 38 000. Ecuador was the principal receiving country of requests for asylum in Latin America and the Caribbean, receiving almost 36 000 requests, in large part from Colombian citizens fleeing conflict zones near the border with Ecuador. 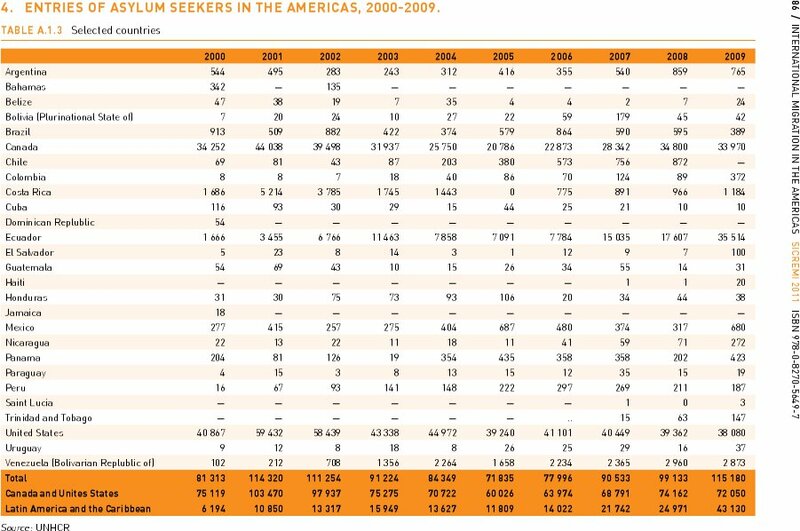 It is a reminder that we need about the effects of Colombian violence on Ecuador, where the growth of asylum seekers is staggering. It also raises a question to which I do not know the answer: why was there a major dip, then a major surge, in people seeking asylum in Canada? Unregulated capitalism, invasions and occupations in Iraq and Afghanistan, and political incompetence in the United States are serving to do what Hugo Chávez wanted but was very far from achieving: bring South America together economically in a way that not only excludes the United States, but consciously keeps it at arm's length. Bolívar would be proud. The Centro de Estudio Públicos poll just came out, with lots of information on education. Since students were out in force, as were the police in response, this was not a pleasant irony for Sebastián Piñera (check out some images here). The CEP poll shows his presidential approval at 26 percent, with little confidence in how he is handling, well, most anything. An interesting point to keep in mind, though, is that for years approval of handling the economy trends very closely to presidential approval. Irrespective of the education protests, Piñera has a shot at recovery if he can turn around perceptions about how he is handling the economy. But he's not in a happy place. Update: Wow, how does Piñera respond? By saying, "Remember the miners!!" I agree with this article in the Sun-Sentinal that when the Cuban government starts talking about easing emigration rules, then you need to pay close attention. In the past, that was how Fidel Castro signalled that a) he wanted certain concessions from the United States; and b) if he didn't get them he would open the floodgates. That happened in 1965, 1980, and 1994, so we are even slightly overdue. There is no need for alarmism, but it has worked very well for Fidel Castro in the past. 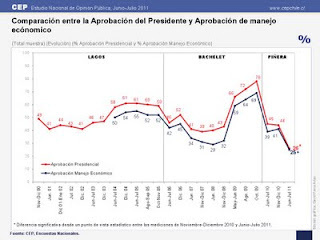 From Adimark: Sebastián Piñera's approval rating remains very low, at 30%. Borrowing a long standing tradition from the Concertación, he has responded to his lack of popularity by changing his cabinet. 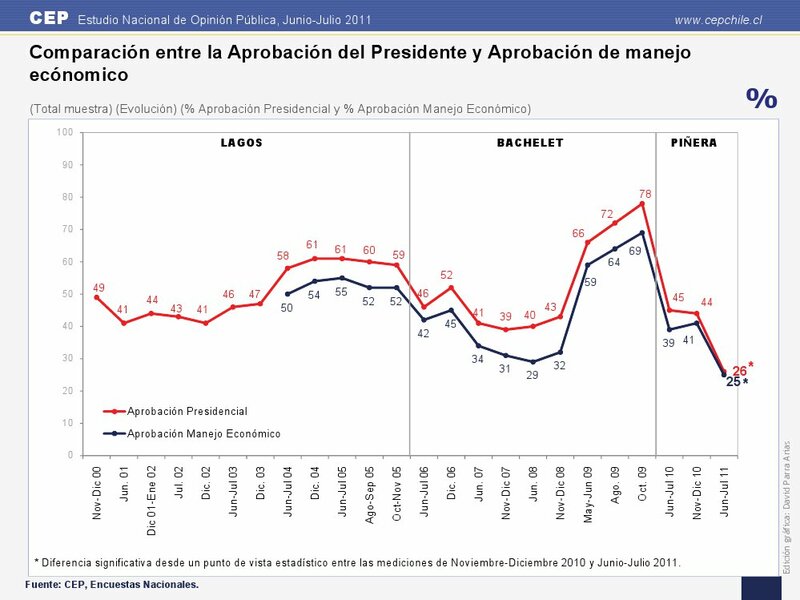 At least in the Chilean case, presidents tend to think that shuffling the cabinet will be seen as a signal that he/she is acknowledging problems and taking positive action. However, I have never seen any evidence that such signals function as intended. Presidential approval is based largely on other issues, and cabinet changes tend just to generate gossip about who will be running for president in the future. Nazih Richani writes at NACLA that more Colombian narcotraffickers want to be extradited to the United States. Between 2000 and 2010, 1,121 narcotraffickers were extradited to the United States. I suspect that through their negotiations with the U.S. judicial system, these narcotraffickers have found that they can obtain benefits outweighing the costs. Some of the perks include prison terms reductions, protections for themselves and their families, and securing part of their wealth. The new Citizen Security Law offers the added bonuses of an expedited extradition and possibly even better benefits. This is a big change. In the past, the Colombian judicial system was seen as so corrupt and porous that people fought to stay in the country, and for years the U.S. constantly pushed for extradition laws. Alvaro Uribe opened the floodgates. With all of the above we have to ask if extradition is truly an effective tool to fight crime. More and more evidence says it is not. Especially for those that have committed war crimes, extradition has become a safe haven since they will only be tried for “narcotrafficking” while their “crimes against humanity” are largely forgotten. However, it is also worthwhile to ask whether the Colombian judicial system has improved to the point that it cannot be gamed as much as in the past. Picture this: A country with a growing gap between rich and poor, where the legislature and political parties are extremely unpopular, though individual politicians sometimes have solid approval ratings. People even protest in the streets at times, though as yet there is no coherent independent political movement. The two main political parties/coalitions point fingers at each other, but when push comes to shove they agree just to create commissions to avoid making difficult decisions. The United States or Chile?